Truth is, this does not provide helpful information for us as individuals. Just because a research study found that a particular treatment works on average, it may not work for you in particular. Or it may even make your condition worse even though it worked for most people. Genome is a quarterly magazine with a stated mission to “empower readers to make informed health decisions that will help them live better and longer.” An article titled “What is Personalized Medicine” points out that most patients are unaware of the limits of medical knowledge. …patient outcomes with today’s medicine show plenty of room for improvement. Consider patients with depression, 38 percent of whom do not respond to the first drug they are prescribed. Or patients with asthma, of whom 40 percent do not respond to the most commonly prescribed drugs. Or type 2 diabetes (43 percent), arthritis (50 percent), and Alzheimer’s disease (70 percent). The shocking statistic for the ineffectiveness of current Alzheimer’s treatment reminds us that there has to be another way. Other treatments. Other ways of studying treatments. 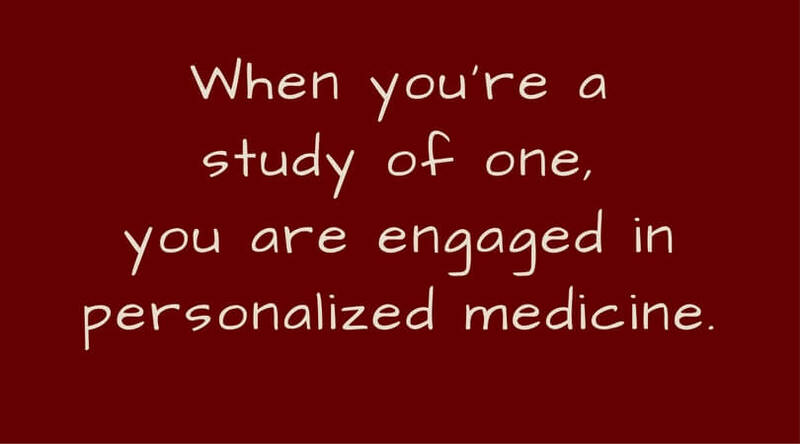 Personalized medicine, with you coordinating your own study-of-one, is the best possibility I know of right now. My experience with a study of one began long before I knew there was such a thing, and I wasn’t the subject of that study—it was my eight-year-old son. For three years I’d been looking for solutions to his behaviour and learning issues that were puzzling because they were sporadic and inexplicable. In those days, this was called hyperactivity. If it was disruptive enough to require intervention, the treatment was Ritalin, a central nervous system stimulant that has the opposite effect on hyperactive brains. I wasn’t about to go the medication route without looking for alternatives first. Back then, there was little consumer health information available, but I found books by Dr. Benjamin Feingold and Dr. Doris Rapp recommending dietary changes for dealing with hyperactive behaviour. Even though both were medical doctors with extensive clinical experience, their protocols were considered outrageous by the medical and dietary establishments. Conventional wisdom was adamant that diet had no effect on behaviour. Shortly after reading those books, I heard about a diet-and-behaviour study that was underway at our local Children’s Hospital. They were testing the effect of diet on hyperactive preschool boys, and results were showing that diet did affect behaviour for better or worse, depending on what the children were given to eat. That encouraged me to run a similar experiment in our household. I’d been looking for solutions for years with no help from conventional wisdom and felt there was nothing to lose by trying it. It was a simple protocol. Remove all additives from our diet for three weeks to allow his body to become clear of them. Then do a junk load using packaged and processed foods that contain a lot of additives. 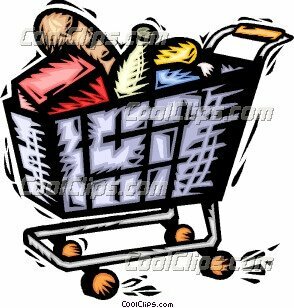 For the junk load, I bought orange powdered fruit drink, blue-coloured cereal, frozen pizza, chocolate pudding cups, chocolate cake mix, pre-made frosting, coloured sprinkles, flavoured potato chips, a huge bottle of cola…and hoped that no one I knew would see me! We started on a Friday night with enough supplies to go through the weekend. By Saturday supper, the boy could not sit still! He was up and down from the table at least eight times, all the while talking a mile a minute in a loud voice. Not quite swinging from the chandeliers, but it seemed as if that might be next. I cut the experiment short. The first 24 hours had given us ample evidence. Nothing would be gained from continuing the junk load. It was an eye-opening experiment which demonstrated that this child was sensitive to food additives, despite the medical view that it could not happen. I had acquired useful information about what to do next. That was 1979. A lot has changed since then…and much hasn’t. The condition of hyperactivity became known as ADD (attention deficit disorder) or ADHD (attention deficit hyperactivity disorder). Today the spectrum goes from there all the way to the extremes of autism and is known as the ASD (autism spectrum disorder). Many conventional practitioners still don’t embrace the importance of diet in treatment of those on this spectrum. At the same time, there’s a growing number of functional medicine practitioners who are thinking more broadly. They know that diet, our microbiome, and how we digest food are all important in understanding the cause of disease and body dysfunction. And they recognize the need for a personalized approach. Many functional practitioners use a great variety of tests to get to the root cause of someone’s illness. Some encourage genetic testing to get an idea of potential weak links. With this information, they can recommend lifestyle measures to help you avoid turning on the epigenetic switches. The newest test, discussed in this podcast, measures what’s going on in your microbiome, the “gut bugs” that make up 90% of our cellular material. I haven’t experienced this test, but it’s intriguing to hear about how it can personalize treatment, adjusting and fine-tuning as the body responds. I don’t think anybody disagrees with the fact that we [patients] are different and we respond differently. But it’s hard to make changes. You [practitioners] want to see evidence before you’re willing to move away from one-size-fits-all traditional medicine. …Patients are not yet asking the question “Is this therapy going to work for me?” I look forward to the day patients do ask that question. 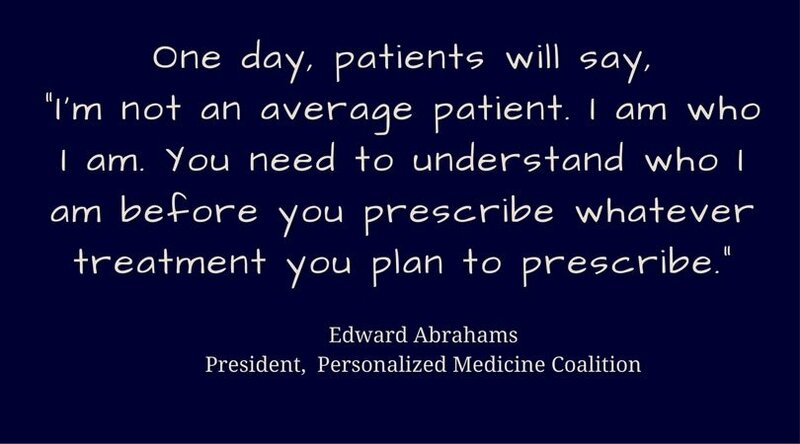 …When that day comes, we’ll no longer [have to] talk about ‘personalized medicine. We’ll know we’ve arrived when personalized and genomic medicine simply is medicine. Are you tired of being viewed as a “case” rather than a person? Have you had a personalized medical experience and how did that change things for you? I’d like to hear your story. There’s a place for comments below. This entry was posted in Fresh Perspectives, Mindset, Viewpoints & Thinking for Ourselves, All Posts—newest first and tagged personalized medicine, Genome magazine, n-of-1, hyperactivity, ADD, ADHD, ASD, diet-and-behaviour study, Personalized Medicine Coalition by Laurana Rayne. Bookmark the permalink.